Dinosaurs, wine, and fresh local food. South Jersey has it all, but you may not know about it. 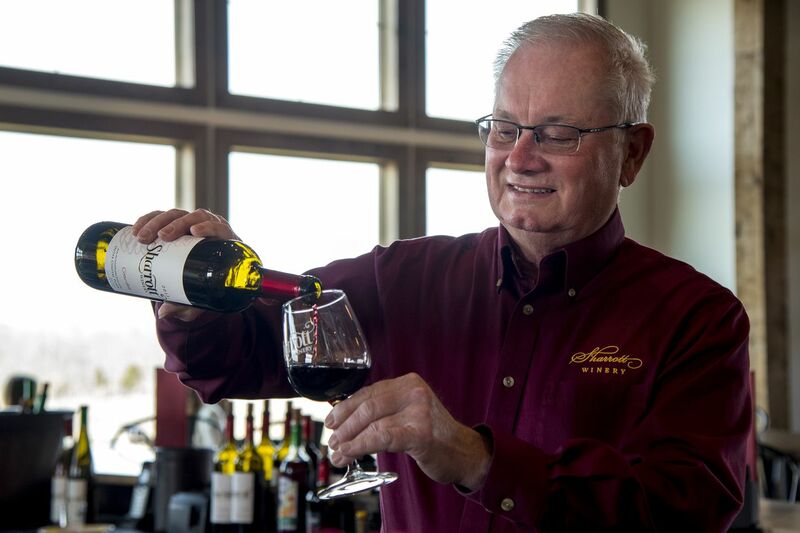 Larry Sharrott, owner of Sharrott Winery in Winslow Township, pours a glass of his Coeur d’Est. He is also president of Visit South Jersey, the marketing organization for Burlington, Camden, Gloucester and Salem counties, that has helped make this region a beverage tourism destination. I know what he means: When the nonprofit was established in 2003, even a longtime resident/unabashed fan like me was rather ... amused, if not amazed, by the notion of fun-seekers disembarking from tour buses in, say, Mantua. But visitors are likely to be doing so in that Gloucester County township when Rowan University’s planned Jean & Ric Edelman Fossil Park becomes a reality. They’re already arriving regularly at Donnini’s Auburn Road Vineyards in Pilesgrove and other well-regarded wineries in Burlington, Camden, Gloucester, and Salem Counties — the sprawling, somewhat amorphous 1,700-square-mile urban, suburban, and rural territory for which Visit South Jersey is the state’s official Destination Marketing Organization (DMO). The success is a testament to the growing public appetite for fresh and local food and beverage products of all kinds, a movement South Jersey, still the state’s agricultural heartland, is eminently well-positioned to capitalize on. And despite a perpetual funding crisis, Visit South Jersey helped put the region on the wine tourism map. “Part of the mission, like the mission we face as wineries, is convincing people that we are legitimate, and that South Jersey is a legitimate tourist destination,” said Donnini, who serves on Visit South Jersey’s board. Made up almost exclusively of volunteers, Visit South Jersey promotes not only “beverage” tourism (local vineyards, breweries, and distilleries) but also the region’s downtowns, arts groups, and events, on an annual budget of $195,000. Convincing outsiders that South Jersey is worth a visit isn’t the only battle. Only Collingswood and Swedesboro (among the 114 municipalities) and three of the four counties in the Visit South Jersey territory support the organization’s current budget, collectively ponying up $57,000. Burlington County doesn’t contribute directly. “The biggest challenge is for local communities to recognize themselves” as potential tourist attractions, said Donnini, who moved to South Jersey from Philadelphia with his wife, Julianne, co-owner and winemaker at Auburn Road, in 2007. The most recent analysis released by the state Division of Travel and Tourism found that visitors to the state spent a total of $43 billion in 2017. That hardly sounds frivolous to me. “Every dollar of advertising and promotion generates $47 in revenue,” said Joseph Simonetta, executive vice president of the 400-member New Jersey Tourism Industry Association. But relatively little of the revenue trickles down to Visit South Jersey or the 20 other destination marketing organizations in the state. Nationally, the typical DMO has a $3 million budget, said former Visit South Jersey executive director Jake Buganski, who also headed up New Jersey’s Division of Travel and Tourism for two years, until last March. “There’s never been an adequate revenue stream to fund these local DMOs,” said Buganski, now vice president of strategy at Tempest, a tourism-industry consulting firm in Philadelphia. Devon Perry, a tourism professional who succeeded Buganski at the helm of Visit South Jersey and resigned in 2018, said her Dig South Jersey proposal — an ambitious concept to promote “all of the dinosaur and fossil-related tourism assets in the region” — did not attract enough local or state support. Perry, Buganski, and others said New Jersey tourism has long focused on the Shore, which in the last 20 years has found itself facing unprecedented competition from Virginia and the Carolinas — much as Atlantic City casinos now compete with upstart gaming halls in nearby states. “Do we have enough money? Hell no. We don’t get funded anywhere near what the Finger Lakes area of New York State, or Virginia, spend to promote their wineries,”said Visit South Jersey board chairman Larry Sharrott, owner of the Sharrott Winery in Winslow Township. Brochures touting the wines and beers of South Jersey are displayed at Sharrott Winery in Winslow Township. VisitSJ, the destination marketing organization for Burlington, Camden, Gloucester and Salem counties, has helped make the region a beverage tourism hotspot. “We have synergy with all the things going on around the region, agrotourism, family fun, restaurants, historical sites, they all intertwine,” said Michael Snyder, a partner in a marketing agency and the manager of operations for Visit South Jersey. As for the future, “we’re putting together a strategic plan that includes the goals of financial stability, and diversification of income,” he said. A more focused message, or branding, effort — similar to the one that has helped establish South Jersey as a destination for wine tourism — might also be in order. The “Dig South Jersey” concept could be a winner. Or how about highlighting the renewal and distinctive character among many of the region’s downtowns, including Glassboro’s sleek new collegiate vibe, the emerging artsiness of Pitman, the postcard charms of Woodstown, or the urbane, Victorian flavor of Merchantville?